See also the Mars Camera and Mars 99 by Emil Wünsche. Mars was a Japanese company which sold shutters and accessories in the late 1930s and early 1940s. It was based in Ebara, Tokyo (currently in Shinagawa). According to the original documents found so far, its full name was Mars Shashin Kōgyō-sha (マース写真工業社), but one recent source gives "Mars Kōgaku Kōgyō-sha" (マース光学工業社) instead, and the marking Mars Kogaku Tokyo appears on the shutter of the Baby Balnet camera. The company made or sold various shutters, including the Lex (T, B, 1–200 or T, B, 5–200) and Patent Mars (T, B, 1–250). A column in Asahi Camera April 1940 featuring the Mars shutter (T, B, 5–200, #00 size) says that the device was distributed by Mars Shashin Kōgyō-sha, but was actually manufactured by a company called Tōyō Seiki Kenkyūjo (東洋精器研究所), about which nothing else is known. In addition to its shutter range, the Mars company reportedly marketed an accessory called "Patent Goal Finder" (パテントゴールファインダー), combination of an eye-level and a waist-level finder. 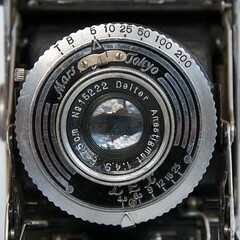 A synchronized version of the Balnet shutter was produced after 1945, perhaps by another company. ↑ Its address was Tōkyō-shi Ebara Koyama 289 (東京市荏原小山289) in April 1940. As of April 1943, it was Tōkyō-to Ebara-ku Ebara 5–28 (東京都荏原区荏原5–28), certainly after a change in the postal system. Sources: column in Asahi Camera April 1940, p.706, and "Kokusan shashinki no genjōchōsa" ("Inquiry into Japanese cameras"). ↑ Column in Asahi Camera April 1940, p.706, and "Kokusan shashinki no genjōchōsa" ("Inquiry into Japanese cameras"). ↑ Column in Asahi Camera April 1940, p.706. ↑ "Patent Goal Finder": p.34 of Camera Collectors' News no.31, from unspecified documents. ↑ 6.0 6.1 6.2 6.3 6.4 "Kokusan shashinki no genjōchōsa" ("Inquiry into Japanese cameras"), shutter item 18-U-12. ↑ "Kokusan shashinki no genjōchōsa" ("Inquiry into Japanese cameras"), shutter item 18-U-3: the shutter is attributed to Earth (アース), but this might be a misprint for Mars (マース). This page was last edited on 9 March 2019, at 06:16.